It is the regional centre of A'Dakhiliyah Governorate. It lies at the foot of Al Jabal Al Akhdar (Green Mountain) to the south, amongst the mountains that form its walls. The city is full of rivers, orchards and palm trees towering amidst a balmy atmosphere. Nizwa farms some forty varieties of dates, and when you climb to the top of the city’s major tourist attraction, the Nizwa Fort, you can see large stands of deep green palm date trees. The town itself is steeped in history as Nizwa is the historical capital of Oman and was the centre for trade between the interior and coastal regions. 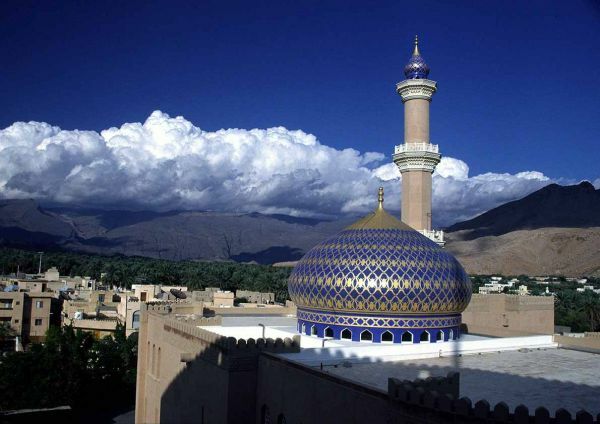 Nizwa, the ‘Pearl of Islam’, was previously a sanctuary for writers, poets, scientists and religious leaders, and rightly so became the cultural and political capital of the country. The ancient souq is still bustling with activity today and together with the fort, they draw many visitors to the area. Nizwa, an oasis settlement, is made fertile by the Falaj Daris, which is classed as a UNESCO World Heritage Site. The fort at Nizwa dates back to the middle of the 17th century and the earth-filled central stone tower is full of sneaky traps. Some steps were replaced with easily breakable wooden planks so that would-be assailants would fall into deep pits. These are mercifully replaced with glass nowadays.